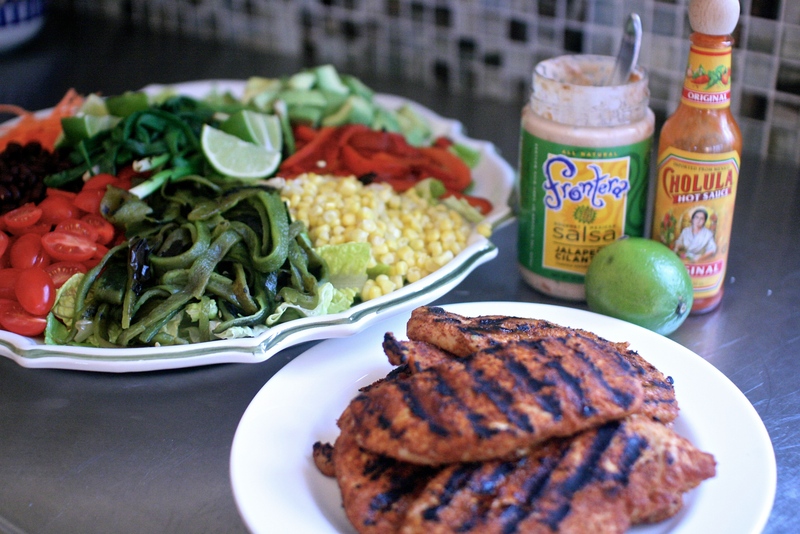 We love this Mexican grilled chicken salad. It’s fairly easy for a weeknight and definitely a healthy choice, it’s become part of our normal dinner rotation. The tomatoes and corn from our local farms have been so delicious this summer and they usually have a nice array of peppers too. Now is the time to make this! To help with your weeknight dinner planning, you could grill-up a double batch of boneless chicken breasts using your favorite BBQ rub or mine (All Purpose Red Rub). 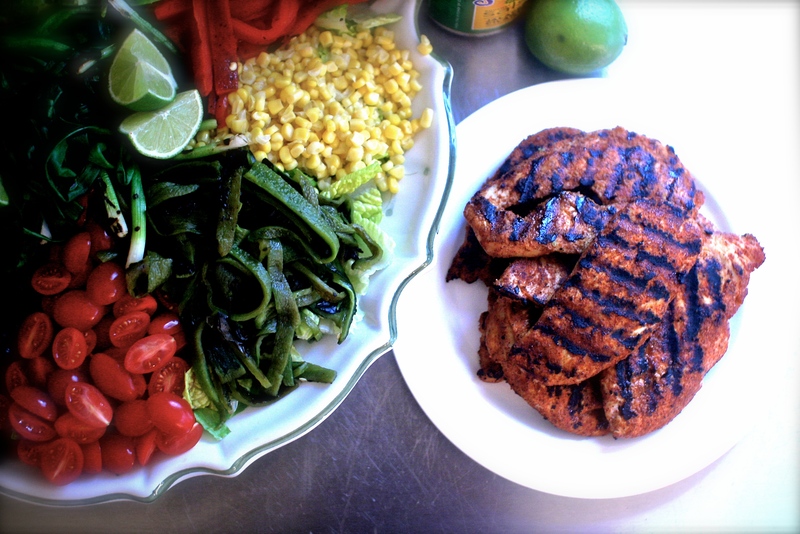 Make chicken fajitas the first night using half of the chicken breasts, and then use the left over grilled chicken for this salad. 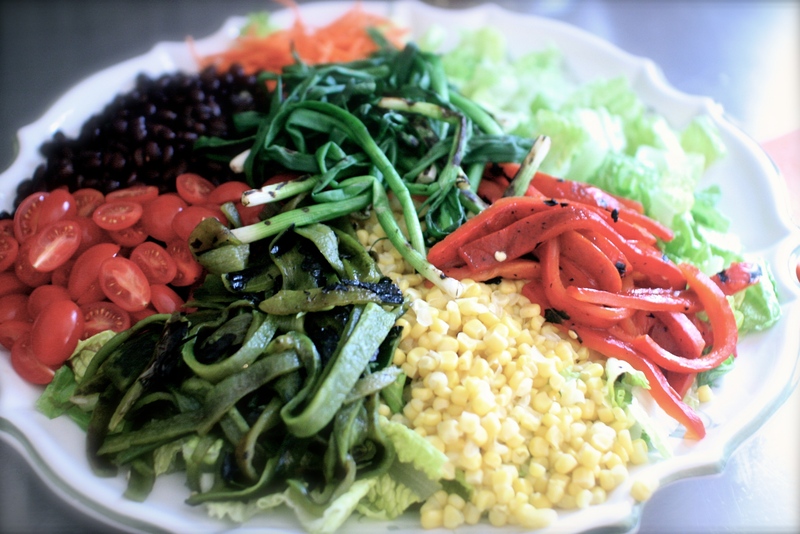 You could also substitute steak or shrimp, or use an assortment of different grilled vegetables to make it vegetarian. Quantities in the ingredients list below are a bit loosey goosey. I generally take the biggest platter we have and fill it up. Three of us eat most of it, with enough left over for a couple of lunch size portions. Not very precise, but you can’t really mess this one up. Just use any combination of the ingredients listed below that you love, and serve it with the dressing on the side… voilà! Or shall I say Olé? 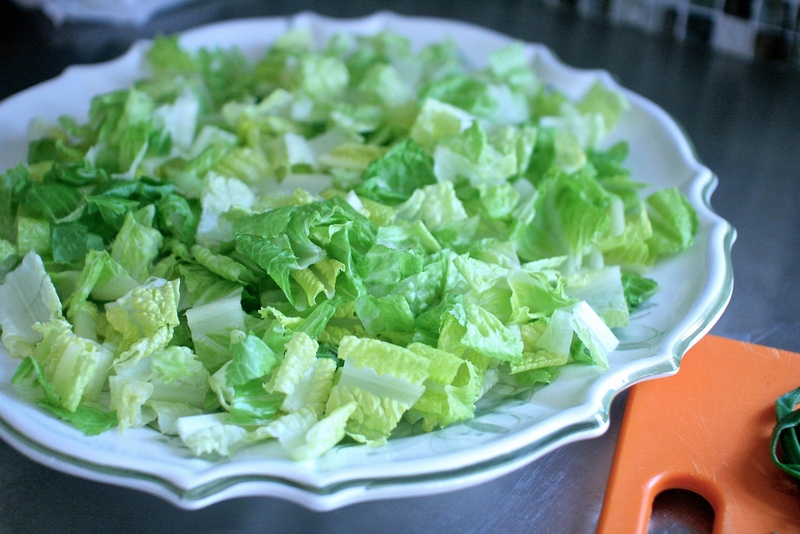 Place the chopped romaine lettuce on the bottom of the platter and pile all the other ingredients on top. 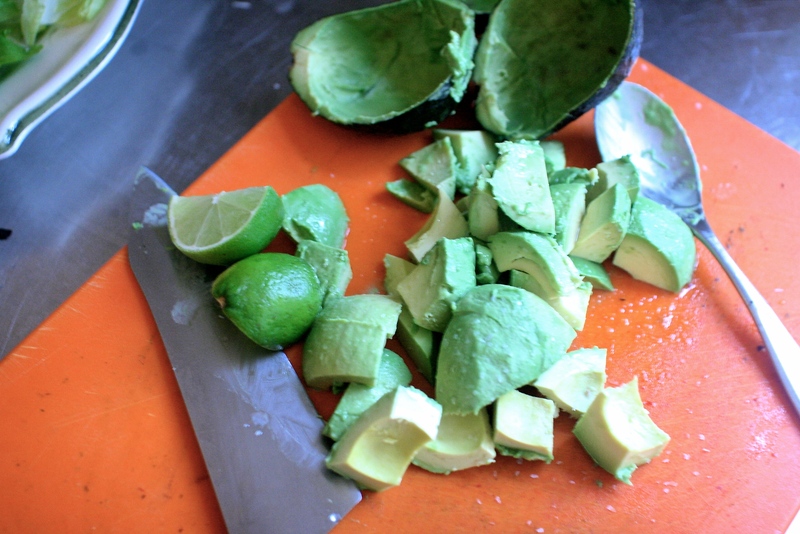 Combine all the ingredients in a bowl and serve on the side with the salad. So easy! 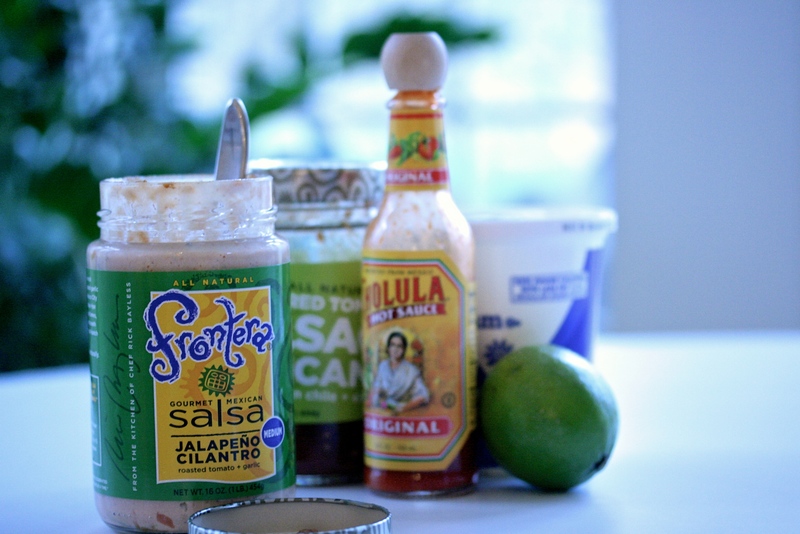 If you’re lucky, your container of sour cream or salsa will only be half full and you can just add the other ingredients right to the container and shake it up. Fancy schmancy stuff! Crushed tortilla chips are a delicious final topping. Yum! *** To make the chicken: pound each breast to an even thickness. Not thin, just even them out. Sprinkle each breast liberally with BBQ rub and grill until properly cooked through to 165 degrees. I’ve become a chauffeur. I know the other moms out there understand all too well. I drive people places and run errands. I’m not complaining, I’ve just had the realization that I spend an inordinate amount of time in my car. I never seem to listen to music. It’s only talk radio these days. NPR, CNN, BBC and my recent discovery, Martha Stewart on satellite. If you follow me, you know I have this tortured love hate relationship with Martha. On one hand I admire her for all her creativity and success. However, I can’t ignore the ridiculousness that is Martha. The other day I was driving around and Martha had on a segment called “Cat Chat.” An entire show dedicated to cats and dogs. There was a call-in segment featuring a pet psychic who could read your pets thoughts and feelings. A caller said that her cat was peeing in the house. The psychic claimed the cat was feeling too much stress in her life. Another woman called in to say her adopted dog seemed upset. The psychic asked for the dog’s name. The dog owner said Bella. The psychic told her that it wasn’t the dog’s real name and its name at the shelter was Happy. The dog was sad the new owners weren’t using her real name. Really? Who comes up with this stuff? I wonder how much Martha is paying this person? I could do this job! I’m sure it’s no surprise that during the holidays, Martha had lots of crafting and decorating tips. For example, you could have embellished your mailbox for the holidays. Just tape stripes around it, primer and paint it, paste on a ladybug and pull off the tape. Voila! Your own lady bug, candy cane striped mailbox. What happens to the mailbox after the holiday? Did you know Martha grows and dries her own catnip? She gave some to Whoopi Goldberg as a gift once. I wonder if she also shares it with the Cat Chat lady? I listened to 10 minutes of discussion about the benefits of cedar balls verses moth balls. She instructed one caller to dip baby booties in paraffin and use them to serve candy for her baby shower. She has an answer for everything. It’s actually quite remarkable. I do like the cooking show. She has guest chefs on the show, including Michael Symon and Mario Batali. That’s very informative, but the chances of my needing to know how to candy cane stripe my mailbox are slim. I must mention that I saw her on TV recently explaining that she lost 150 trees on her property in hurricane Sandy. She said she recycles the trees, which is nice. She goes into the woods with a saw and cuts the trees herself. Then, of course, she brings the wood home and makes votive candle holders using her trusty drill. Amazing! We don’t even own a saw. Our fallen trees from the hurricane are now home for the squirrels. If I had a saw, I guess I could be out there now, gathering wood to make stuff. No kidding, after all this mocking of Martha, my Martha Baking Book has gone missing. I think it’s the Cat Psychic… she’s made it disappear as punishment for disrespecting Ms. Stewart. No disrespect, it’s just that Martha makes me feel lazy and uncreative. On a positive note, she’s providing me with countless hours of entertainment when I’m in my car. * This recipe has nothing to do with Martha Stewart, I just needed an outlet for my Martha obsession. Heat a large dutch oven on the stove at medium-high heat and add the olive oil. 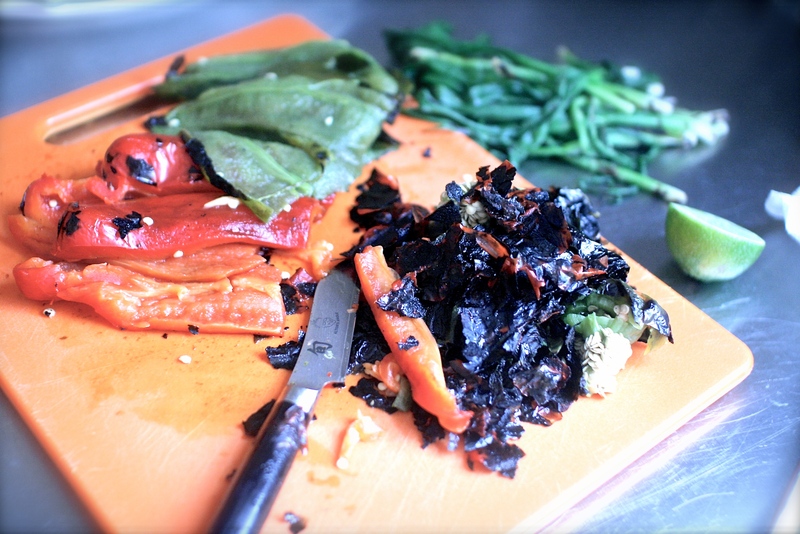 Saute the peppers and onion until they begin to soften. Add the garlic to the pan and stir, cooking until it becomes fragrant. Add the meat to the vegetables and cook, stirring often until the meat is browned. Depending on how lean your meat is, you can drain off any excessive fat. Add the beans and tomatoes to the meat mixture, along with the spices, stir to combine. Bring the chili to a hard simmer and reduce the heat to low. Cover and simmer gently for about 2 hours, stirring occasionally. I let this sit on the stove for 3-4 hours. 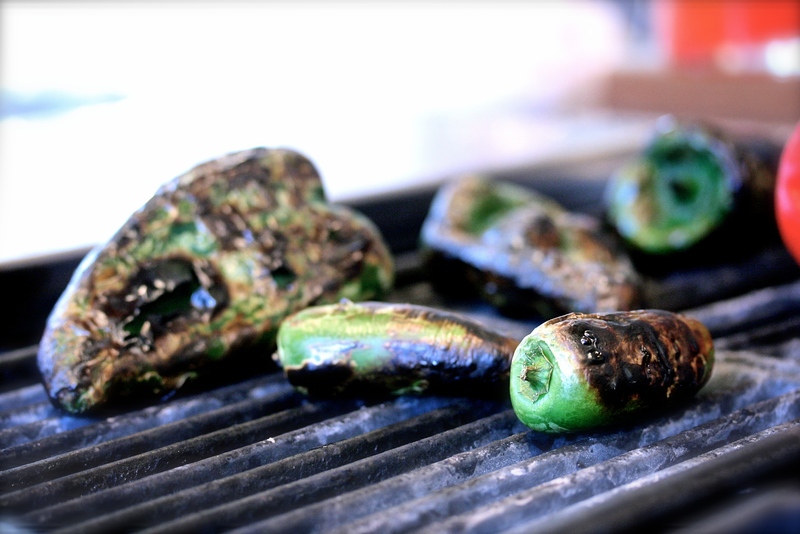 It just gets better as the flavors come together, so you can’t really over cook it, just keep the heat low. WHAT TO DO WITH THE LEFT OVER CHILI? We made these taco salads the next night. Romaine lettuce, tomatoes, red onions, sliced avocado, corn, pickled jalapeño and red bell peppers. A big ladle of warm chili in the middle and a handful of crumbled tortilla chips on top. For the dressing, I combined just about equal parts of jarred salsa and sour cream. I didn’t measure. Just “eye-ball it” until it comes to a dressing consistency.